The story begins at the beginning but goes on without end. The history of Abbey United and Cambridge United is the remarkable tale of a club rooted in its community; a club that has evolved and progressed as that community and the game of football have mutated in like fashion. The game portrayed in the photograph above left (the first competitive match at the Abbey Stadium in 1932) appears to have little in common with that which led to the celebrations pictured above right (Wembley 2014 as the U's win promotion back to the Football League). 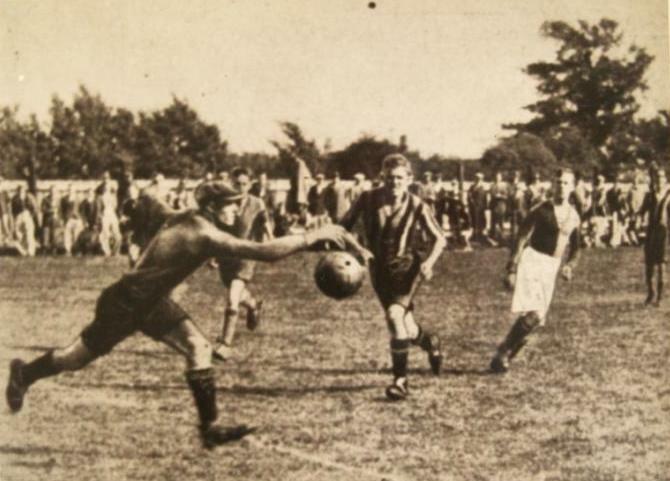 Similarly, the neighbourhood of Barnwell, the city of Cambridge and the county of Cambridgeshire have been transformed beyond recognition since Abbey United was formed in 1912. But, thanks to the vision and labours of good men and women united in endeavour, there has always been at least one constant in both community and sporting sphere: the football club. To find out how the club evolved from lowly beginnings before the Great War to threaten the giants of the game in the 1990s, then fell and rose again while always paying tribute to its roots, start reading here.